Equipped with sophisticated production facilities, we manufacture highly effective Pediatric Equipment. 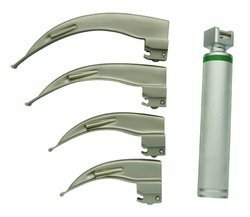 The extensive array includesInfantometer, Baby Incubator (Servo Type), Pediatric Laryngoscope, Baby Resuscitation System and many more. Our entire array is fabricated from the Acrylic sheets, suction gauge, silicone tubes and many more materials. These devices are extensively used in the Private nursing wards, Health care units, Government hospitals and surgical operation centers. We manufacture our comprehensive array in varied sizes and designs to suit the needs of the multiple customers. The set of four Macintosh blades is different sizes are available in a case. Construction made of stainless steel wire four blades and one handle, Kacurt type locking system for locking the blade on the top of handle, easy to replace batteries, two dry batteries of medium size for handle, two spare bulbs with unit. We are one of the noted manufacturers and exporters of a wide range of pediatric instruments such as Infantometer (item code: P. E-01). 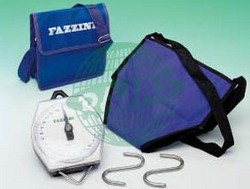 Made of premium grade acrylic sheet, the instrument is used to measure the length of infants up to 90 cm. 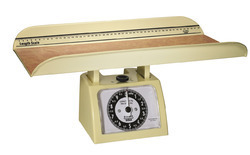 Available in varied models, the infantometer has adjustable scale to measure the height of the new born children. Our infantometers are applauded by the clients for the properties like light weight, easy portability and precision measurement. We offer our infantometer to the clients at competitive prices. 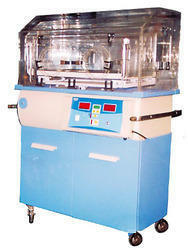 With the assistance of highly experienced team members, we make baby incubator ( servo type) (item code: P. E-02). Our baby incubator is used to take care of new born babies in the special icu unit. Also known as neonatal intensive care units, these systems are used to control the skin temperature of the new born babies. The appliance is formed of various components namely three level safety circuits, two sensors , L. E. D. bar graph with 4 increments to show temperature level, A1 auto cut-off at 38. 5c air and 37. 5c skin, solid state relay system & parallel electrical safety. 230 V.A.C.- 10% 50 Hz. 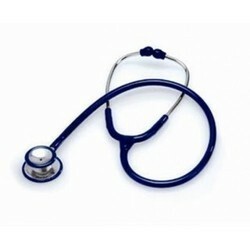 Stethoscope offers acoustical excellence in a traditional design, It s Innovative feature That ensure it is considered one of the most appreciated cardiology stethoscope in the world Included; the stainless steel/Brass chest piece diameter 36 to 47 mm diameter with extra deep Cone shaped bell for a superb low frequency response, stainless steel/Brass double inner spring Binaural, and floating diaphragm for unsurpassed amplification durable, elegantly mounded PVC Black tubing, Colour co-ordinates non-chill ring and diaphragm retaining ring for excellent Patient comfort while adding attractiveness. The stethoscope supported with special foam Lined box with spare one piece of earplug and one diaphragm. 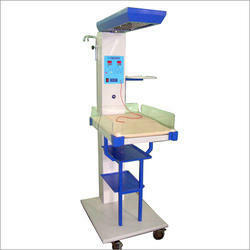 Physiotherapy Unit For Pediatric Jaundice Management Surface Rajas offers phototherapy unit double surface. The phototherapy unit double surface is manufactured to be used in the treatment of hyperbillirubiaemia in neonates. Phototherapy unit double surface combines under surface phototherapy unit and over head phototherapy unit. Some salient features of undersurface phototherapy unit are as follows compact and mobile head down position, on both sides. Baby bassinet with fold down panels phototherapy unit fitted at a distance of 300 mm from baby bed. 6 nos. Of white light tubes with the facility to use 4 or 6 tubes at a time 4 blue + 2 white tubes in overhead phototherapy unit, giving choice of two kinds of tubes to use with. 4nos of blue light tubes with higher intensity of light in therapeutic range and 2 nos of white light tubes. Baby weight scale made of plastic body and with plastic removable tray, the unit really light weight and handy, weight adjusting knob providing to make the unit set on the standard weight point before use, capacity 10 to 15 kegs. Rajas offers microprocessor-based servo / Manual controlled proper heating over a bed, bassinet or examination table or wherever warming is needed. unit supplied With digital display for skin temperature and set temperature, Product servo and manual control modes for operating the warmer system. You can use product in manual mode which allows the warmer to be kept "baby ready" without any nuisance alarms. Microprocessor-based control panel makes operation quick and easy. It has a manual mode that allows warming without delay. 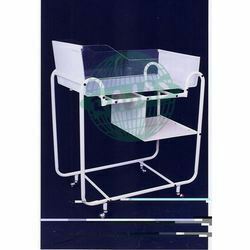 Stainless steel baby tray with transparent slot help in incorporating the facility of under surface phototherapy. Its small heater made of ceramic/quartz makes it easier to work with the baby by providing even heating over the mattress and not of the surrounding environment. It also contains acrylic tray and cushion mattress with head up/down facility. It use focused heating with a Halogen Examination Lamp (12 Volts, 50 Watts) to provide accurate assessment of Infant colour and sufficient illumination during procedures. The self-test mechanism puts off an automatic alarm in case of a failure. The alarm is set for different failure modes which are automatically detected by the incubator. A full complement of alarm provides safety convenience. The set and skin temperature displays are large and have blinking mode. The displays are clearly visible from distance of over 3~5 meters and more, larger than the typical temperature displays. 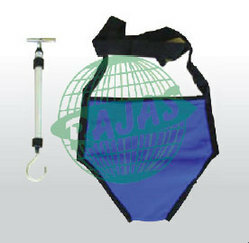 The design of our models allows easy dismantling during cleaning or fumigation. Clear acrylic fold down side panels are useful with acrylic X-ray tray and X-ray guide for positioning the cassette. With a wide set of optional accessories like LED Examination Light, Baby bed made of stainless steel and under surface phototherapy unit, this Infant Radiant Warmer System helps you provide 100%reliable infant warmer at all times. Safety; over temprature cut off device installed, double thermostate for safety of the equipment. 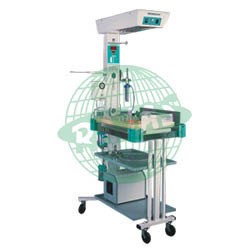 Our company is one of the prominent manufacturers, traders and suppliers of Baby Resuscitation System (Item Code: P.E-03). This is a movable Pediatric instrument mounted on wheels with lower shelf and fixed baby cradle. A neonatal resuscitation unit consists of all facilities like suction, oxygenation and incubation for baby care. Our all neonatal equipment is manufactured in total compliance of the industry specified quality norms. 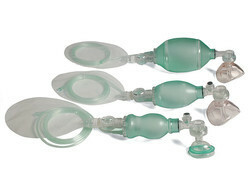 We procure high grade materials from the certified vendors for manufacturing our all baby care devices. Electrically operated low pressure Suction unit with 2 Auto clavable 500 ml suction jars, Regulator, Suction gauge and silicone tubing. Baby weight machine pocket model easy to carry provided with weighing cloth with strips capacity of the machine up to 20 kegs, upper and lower hinges provided with the machine to hang the weighing cloth comfortable way, upper hing to hold the machine in the hand of user or to hang with nail on the stand.